Decoy carving, Jersey Devil doings highlight the coming weeks. New Jersey Monthly to recognize philanthropist Ray Chambers and 3 Jersey-based companies. Golf’s top players to compete at Northern Trust tournament at Ridgewood Country Club. Tapas-style appetizers are abundant and easy to share at this sleek, diner-like spot. City by the sea wins 10 categories in 2018 Restaurant Poll. While his brother achieves film and TV fame, Jonathan Dinklage thrives under the stage as lead violinist of Broadway’s Hamilton. Summer reading isn't just for students. Whether you're at the pool or down the Shore, these books by New Jersey writers will make the perfect companion. 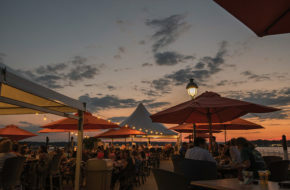 Great sunsets along with a hearty sampling of seafood dishes at this charming Atlantic City spot.